River cruising, primarily in Europe, has become the hottest trend in travel in the past few years, with thousands of travelers raving about the experience. For travelers 40+ the concept is quite intriguing: the intimacy of a small ship, the opportunity to visit numerous European cities deep inside the Continent and, best of all, the ability to do it without ever having to pack and repack along the way. 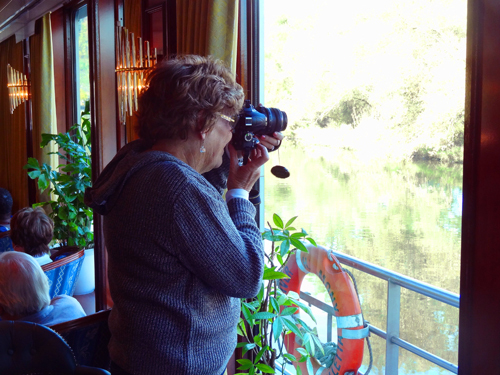 Since I’ve traveled on small ocean-cruise ships in the past, but never on a river cruise, I decided to experience a river cruise first-hand and share my experience with you. Just as important as experiencing the cruise though, was taking a hard look at the company itself, important since so many companies have now entered the river-cruise business. The cruise line I selected was Grand Circle Cruise Lines and I recently sailed on their “Great Rivers of Europe” cruise, a two-week odyssey on Europe’s Danube, Main and the Rhine Rivers. Although I selected the specific cruise and the date, Grand Circle did host me on board their ship while I paid all other costs. To get a good cross-section of opinions on the company and the overall passenger experience, I spoke with a large number of my fellow passengers, usually by sitting with different groups of people at approximately 30 or so meals. I also had numerous additional conversations both on- and off-ship. Amazingly, in all those conversations I heard only one mildly negative comment, that about an excursion taken on another Grand Circle cruise. 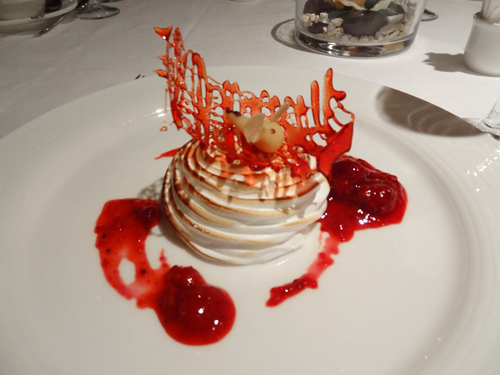 Without appearing to be a shill for Grand Circle, I will say that my cruise experience was a very enjoyable one. Interestingly, not long after my return home Condé Nast’s Readers’ Choice Awards corroborated my opinion, ranking Grand Circle as the best river cruise line in the world. More amazing, however, was that the company was rated higher than all other cruise lines in the world, both river and ocean vessels. The vessel I sailed on was the MS River Harmony, a low-slung ship built to let it clear river bridges, which is 361 feet long with a beam of 38 feet, just the right size for an intimate voyage. To put that in perspective, Royal Caribbean’s Oasis of the Seas is 1,187 feet long, 208 feet wide and can carry 6,296 passengers. The River Harmony maxes out at 140, all in outside cabins. I boarded the River Harmony in Vienna late one Saturday afternoon for the cruise to Amsterdam (you can do the trip in reverse if you’d like). After dinner I picked up a copy of the “USA Times,” a condensation of the top news stories from the day, and headed back to my cabin. There I found the itinerary for the River Harmony’s program for the next day, which covered everything from our setting sail at 2:45 AM, to after-dinner entertainment with pianist Reggie in the lounge. I also found a small book put out by Grand Circle, “European River Cruising, Great Rivers of Europe,” which discussed each of the countries we’d be traveling through, covering just about everything you could think of from the country’s political system and economy, to its cuisine and sites of interest to tourists. Additional information relating to everything we would see and experience continued to be provided daily throughout the voyage. When I awoke the next morning I looked out my window and realized we’d been underway for some time. I was surprised since I didn’t feel the sense of rocking or moving that’s normal on larger cruise ships. It was as smooth as if I was sitting in my own living room at home. I also became aware of just how quiet the whole ship was. Only once during the voyage did I hear a sound from another cabin, and that was when someone next door slammed a drawer. 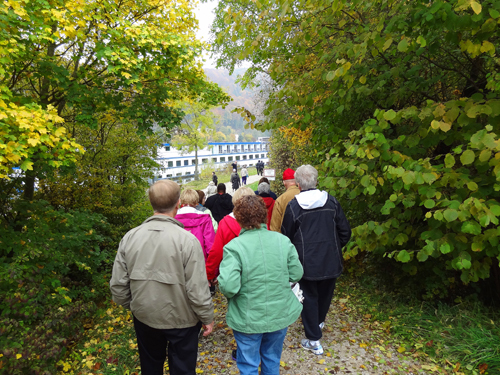 On the first day we were all split into three groups, each led by a different tour director. Eva, a young German woman who was the director of my group (the other directors were Dutch and American), watched over us both on- and off-ship and often passed us on to local English-speaking guides in various cities. The local guides were quite good also and, according to those I met who had taken river cruises on other cruise lines, provided a more intimate look into the character of the places we were visiting then Grand Circle’s competitors. I soon fell into the rhythm of these city tours. Another rhythm I fell into was the on-board meals, which unlike those on mass-market cruises, were served only at a single seating. 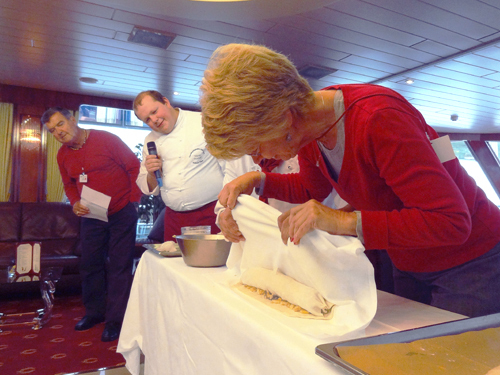 The meals were top-rate and varied – some keyed to the area through which we were sailing ­that day – although there were specific dishes available at any time. 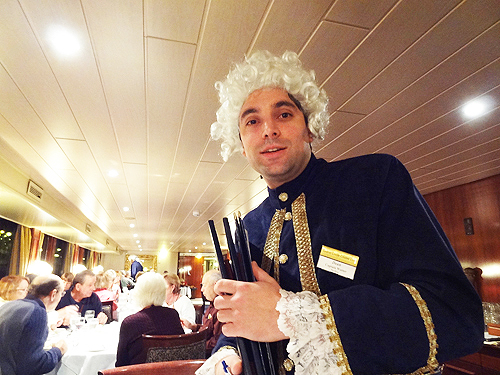 At different times the dining-room staff would dress in different costumes depending on the area we were sailing through ­– Mozart as we were leaving Austria, Bavarian in Bavaria, etc. 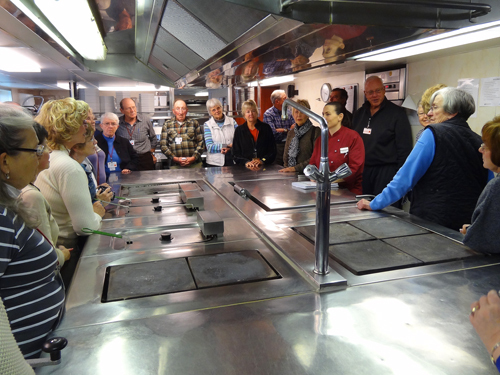 One day we were able to tour the kitchen and ask questions of the amiable chef. It was one of the additional activities provided daily, usually in the large lounge, which were as varied as a glassblowing demonstration, a lesson in strudel-making and a lesson in “tourist” German. There were two things, however, that surprised me from the very start. The first was the crew, the warmest and most convivial I’ve experienced anywhere on land or sea. In fact, during the first 48 hours or so I was amazed at the number of times I saw a passenger hugging a crew member whom they remembered from a previous cruise on a sister ship. All the crew speaks perfect English even though they are an international mix, and they dote over you as if you were royalty. One cold afternoon when we came back from a tour of Rothenberg they met us at the gangplank with cups of hot chocolate; another day returning from Heidelberg they met us with mugs of warmed, spiced Glühwein. 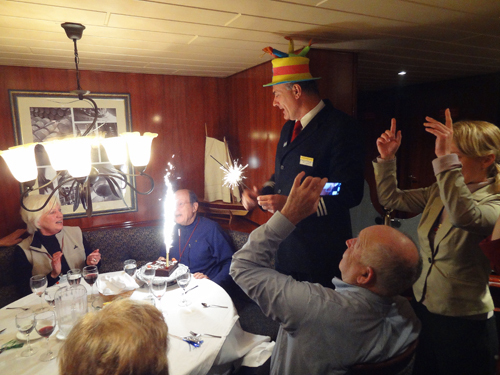 The second surprise was the incredible following Grand Circle has developed among river cruisers. 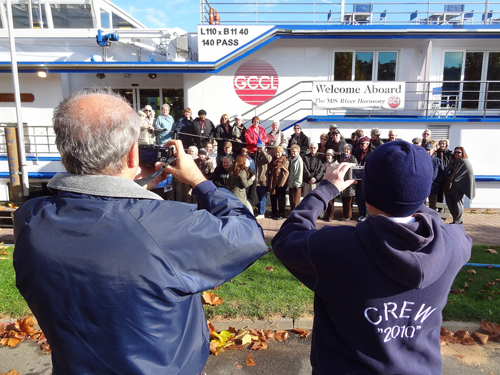 I was astounded to learn how many of my fellow passengers had previously taken a Grand Circle cruise in other areas of Europe, or who had gone on a tour with Grand Circle Travel elsewhere in the world. 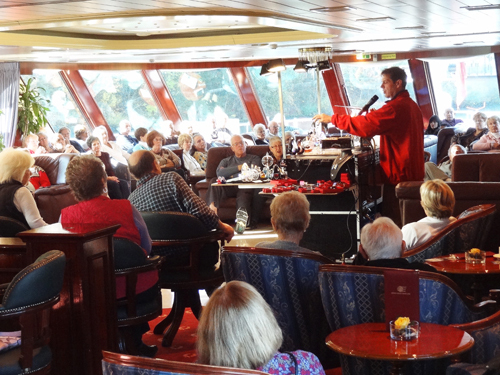 Many I met had been on at least 4 to 6 Grand Circle cruises, several others on more than 20. Several commented that Grand Circle always provides so many different things to do, options they would pay extra for with other tour operators. And there was also, many said, the cultural experience provided, something that Grand Circle seems to pride itself on. Two couples told me that on a cruise in Russia they had dinner in local homes. We also visited a local home after docking in the small town of Riedenburg. 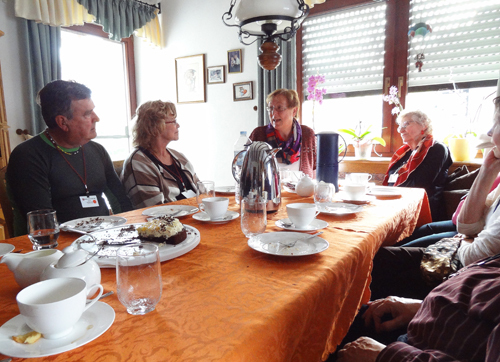 From there we were bused to a small town where each of our groups had a Kaffeeklatsch in a local woman’s home. At first I wasn’t going to go on the optional tour, then Eva convinced me I’d enjoy it. Not long afterwards I found myself with 12 others around a kitchen table in the small village of Beilngries engrossed in a wide-ranging conversation about Lilly Ehbauer’s children, German taxes, cooking, even about her husband getting a drivers license for their upcoming trip to California. When leaving we saw her neighbor tending her garden, and those who came from farming communities were amazed at how black the soil was. Being an urbanite, I was bowled over just by the size of her heads of lettuce. It was an exceptional two weeks onboard, cruising down a river with a glass of wine in my hand, watching the vineyards running up and down hillsides around little villages, knowing that the next morning we’d be stepping ashore and enjoying the sights, the culture and the food of another city. And all without ever touching a suitcase. River cruising is without peer in the tourism industry. In no other hospitality environment is a “community” of like-minded travelers created in a short time span. 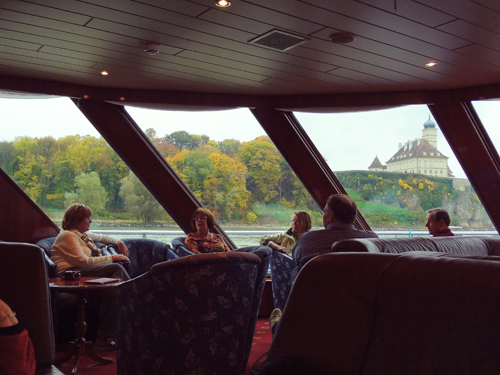 A river cruise’s greatest contribution, though, to a passenger’s experience, is that a river cruise ship docks at the gateway to a medieval city, in most circumstances. You are in the “heart” of a destination a thousand years old, with its magnificent buildings and quaint cultural attributes. And passengers DO development kinships with crew. I’m so happy you enjoyed your river cruise, Jim! Thanks, Donna. I know that you’re a dedicated river cruiser and I agree with everything you said. One other thing I’ve also realized from this trip is that river cruising not only provides exceptional “bang for the buck” from a budgetary perspective but also from a cultural one. and, Jim, you get that cultural “bang” even while ONBOARD! Gliding past country towns and its houses sitting alongside the river, you get an intimate glimpse into the authentic lives of local people. A couple of weeks ago, from my cabin, I saw a person (man? ), snow-shoeing not far from the shoreline. Okay, maybe it was cross-country skiing, but, it was definitely a person with sticks in each hand …. and witnessing our progression through a lock was fascinating! A super article about the trip that we were fellow passengers. I enjoy the reviews that are available on your website. I remember you well. I practically chewed your ear off telling you about my camera. Thanks also for the kind words about the website. We did Great Rivers in 2007, Rhine & the Mosel in 2009 and Normandy to Paris in 2010. We love unpacking once for 14 days, not having to look for restaurants where we do not speak the language and waking up in a different city each day. Plus, we have found GCT river cruises to give you the most bang for your buck!!! 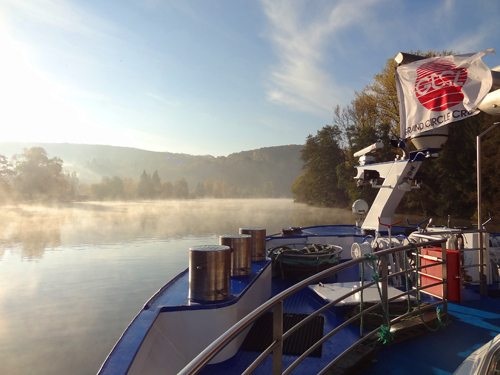 I enjoyed reading your comments about our Oct. trip on the Danube, Main and Rhine. It was my 4th trip with GCT (and I’ve taken 11 with their partner OAT). Except for rivers being a part of a trip (China, Peru, Egypt) I’d never done a real river trip and this one was very good. I especially liked the crew’s internationality. Seeing people from all over the world working well together was a delight. Of course the Captain made me feel like a Queen when he escorted me into his dinner party our first night. I’m glad you liked the article. In my mind you’ll always be the Queen of the MS River Harmony. Thanks Donna. I appreciate your kind words. Hi Jim; have you considered going/ have been to rivers further out, such as the Mekong? Hi Bernard, I’d like to get to the Mekong, as well as a number of other places. It all takes time…..
I’d love to go; I can just imagine the views.. It’s all about prioritising and my priority will be going there at some point.